My trips to the farmer’s market often turn into mini-culinary education sessions. This last week, I was asked by a fellow shopper what I planned to do with the large bouquet of squash blossoms I had purchased. Realizing that many people are unfamiliar with how to prepare these culinary delicacies, I thought I’d take a minute to share my favorite ways to enjoy them. First, a little on how to select a good batch of blossoms: Look for flowers that are bright yellow/orange in color, slightly open, with petals that show as little wilting as possible. If you have a local farmer’s market, check it out for the freshest selection. Try to find blossoms that come with longer stems, if possible. If your blossoms have decent stems, you can store them for a few days in the refrigerator by filling a small jar with water, placing the flowers in it (stems down), and then covering with a plastic produce bag. Blossom will stay fresh for 3-5 days with this method. Otherwise, if you have a batch sans stems, try to use them within 48 hours for maximum freshness. To prepare blossoms, remove the pistils/stamens from the inside of each flower. Some people like to remove the stems fully, but I simply like to trim the longer stems. I prefer this for a couple reasons: a) the stem has quite a bit of flavor so it’s a shame to lose it, and b) keeping the stem intact helps maintain the integrity of the shape of the flower. Removing the stem will sometimes allow the petals to disassemble, so just keep this in mind if you’re trying to serve the flowers whole. 1) Sauteed squash blossoms: Heat 1-2 T. coconut oil in a small skillet over medium-high heat. Add squash blossoms, cook 2-3 minutes until lightly wilted, then serve as an accompaniment to any meal. 2) Squash blossoms in the raw: To truly taste the spirit of these summer gems, chop them and incorporate them into a summer salad, where they’ll lend both flavor and color. One Italian-inspired combination I enjoy: Arugula, Shaved Fennel, Squash Blossoms, Hazelnuts with a summer herb vinaigrette. Squash blossoms are only with us for a couple more weeks as the summer comes to a close, so seek some out and enjoy them as part of your next meal. 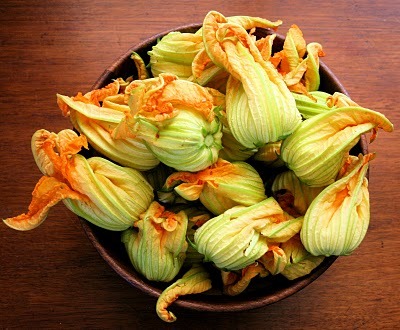 And, of course, feel free to comment with your favorite uses for squash blossoms!